How do I insert a review box into my post/page? How do I create my own custom star icons? Right now you have to add custom icons to the /icons folder in the "Easy Review" plugin. Its easy to do but be careful that downloading updates to this plugin may remove them. If you make a good set and want to share them, please send them to us and we will include them in the default set! I get the following message in my posts: "EASY REVIEW BUILDER SHORTCODE ERROR"
Your shortcode has an illegal parameter, or perhaps a new line. Make sure the shortcode is in one single line. It can wrap of course, but sometimes editors place implicit breaks... these become HTML codes under the covers and confuses the shortcode parser. This message was created to help identify when these situations were occuring. If your problems continue, please contact us. How can I support your plugin? 2) Advertise our Flitter! iPhone app on your site. You can use the graphics right off of this site's main page or contact us if you want something custom. 3) Donate via PayPal. The sidebar on your right over there has a paypal donation button. This list is in no particular order, whatever you choose would be wonderful to us! I still get the "EASY REVIEW BUILDER SHORTCODE ERROR" and I know I have entered everything correctly! This will prevent the plugin from matching its keywords, and allow our shortcode to show the correct text. If your problems continue, please contact us. Could be a bug in our stuff you know! 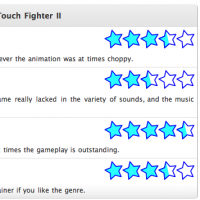 I got really interested in the plugin that you have on this page with the hand rating on the side of each question. Can you tell me please wich plugin is this one or if that is a lugin at all? i tried to use different icon set. but, where to insert this in the shortcode? icon=”star1″ etc? Description: Which star icon set to use. There are currently four icon sets: star, star2, gear, and bluestar. You can make your own but currently they must reside in the icons folder of the plugin. Email us any sets you make that you would like to be available in the default set. It does not matter where in the list of shortcode arguments you use icon=”bluestar” (or whatever icon set you are using). If you think you are experiencing a bug let me know. In general you can specify the shortcode arguments in any order. Hey, is it possible to just have these as numerical values, and is there a way to “upgrade” the maximum score from 5 to 10? Thanks for the awesome plugin. Also, are there any plans to database these for a review database? You can change the number of stars by using the ratingmax argument (in this case, ratingmax=”10″). Not sure what you mean by numerical values, you mean why you can’t do ratingmax=10? The plans for erb are first to get a gui for entering/editing reviews. Then if I can work in lightweight database support, that is a good next step. Lots of work on the plate right now, but an update to the plugin is planned. Ill think about some icon variations like that. Thanks. I was just going to use whole number ratings and no fractions so I wasn’t even considering fractions. any instructions on how to put directly into the template files? I am trying to figure out how to make this so when I either pick a review category it will auto populate with the review fields I want or maybe when I pick a post template it would do the same. I am having some trouble. I don’t feel like copy and pasting the code every time I do a review. That would just be annoying. how to add below my image box…on this website..
Hi, thanks for a useful plugin. Is it possible to style the output to not occupy the full width of the column it is in. I would like a smaller box that text could flow around – maybe even by conversion to a graphic – something similar to what you have at the top of the column. I am trying to use this plugin on a table. I would like to have an independent review for each row of the table. How can I do this?